Port Authority Trans-Hudson (PATH) is a rapid transit system connecting the cities of Newark, Harrison, Hoboken, and Jersey City, in metropolitan northern New Jersey, with the lower and midtown sections of Manhattan in New York City. The PATH is operated by the Port Authority Trans-Hudson Corporation, a wholly owned subsidiary of the Port Authority of New York and New Jersey. PATH trains run 24 hours a day and 7 days a week; four lines operate during the daytime on weekdays, while two lines operate during weekends, late nights, and holidays. The system contains 13 stations and has a total route length of 13.8 miles (22.2 km), not double-counting route overlaps. 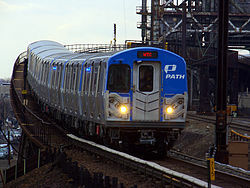 PATH trains use tunnels in Manhattan, Hoboken, and Downtown Jersey City. The tracks cross the Hudson River through century-old cast iron tubes that rest on the river bottom under a thin layer of silt. The PATH tracks from Grove Street in Jersey City west to Newark Penn Station run in open cuts, at grade level, and on elevated track. The routes of the PATH system were originally operated by the Hudson & Manhattan Railroad (H&M). The railroad's Uptown Hudson Tubes first opened in 1908, followed by the Downtown Hudson Tubes in 1909, and the system was completed by 1911, with 16 stations. The H&M system had reached its peak in 1927, with 113 million passengers, and soon started to decline with the advent of vehicular travel. In 1937, two new stations in Harrison and Newark were built, replacing three existing stations. Two other stations in Manhattan were closed in the mid-20th century. The H&M went into bankruptcy in 1954. It operated under bankruptcy protection until 1962, when the Port Authority took it over and renamed it PATH. In 1971, as part of the construction of the World Trade Center, the Hudson Terminal in Lower Manhattan was replaced by the World Trade Center station. The PATH system was disrupted for several years after the World Trade Center was destroyed on September 11, 2001, and a new transport hub was eventually built at the site of the World Trade Center station. There have been several unfulfilled proposals to extend the H&M and later the PATH, including to Grand Central Terminal and Astor Place in New York City and to Plainfield, New Jersey. A PATH extension to Newark Airport, first proposed in the 1970s, was reconsidered in the 2000s and is projected to start construction in 2020. The PATH's primary method of payment is SmartLink, a smart card which is not presently compatible with any other transit system, though PATH has plans to expand its usage. PATH also accepts the same pay-per-ride MetroCard used by the New York City Transit system, but it does not accept unlimited ride, reduced fare, or EasyPay MetroCards. In 2017[update], PATH had an annual ridership of 82.8 million passengers, with an average daily ridership of 283,719. The PATH system is technically a commuter railroad under the jurisdiction of the Federal Railroad Administration, even though it operates as a rapid transit system. This is because its predecessor, the H&M, used to share its route to Newark with the Pennsylvania Railroad. The PATH uses one class of rolling stock, the PA5, which was delivered in 2009–2011. The PATH predates the New York City Subway's first underground line, operated by the Interborough Rapid Transit Company. It was originally known as the Hudson & Manhattan Railroad (H&M). Although the railroad was first planned in 1874, existing technologies could not safely tunnel under the Hudson River. Construction began on the existing tunnels in 1890, but stopped shortly thereafter when funding ran out. Construction resumed in 1900 under the direction of William Gibbs McAdoo, an ambitious young lawyer who had moved to New York from Chattanooga, Tennessee. McAdoo later became president of the H&M. The H&M became so closely associated with McAdoo that, in its early years, they became known as the McAdoo Tubes or McAdoo Tunnels. One of the original plans, with branches to the Central Railroad of New Jersey Terminal (lower left) and the IRT Lexington Avenue Line at Astor Place (center). The first tunnel, now called the Uptown Hudson Tubes, started construction in 1873.:14 The chief engineer of the time, Dewitt Haskin, tried to construct the tunnel using compressed air and then line it with brick. The workers succeeded in building the tunnel out by approximately 1,200 feet (366 m) from Jersey City. :12 However, construction was disrupted by a lawsuit, as well as a series of blowouts, including a particularly serious one in 1880 that killed 20 workers. The project was abandoned in 1883 due to a lack of funds. :67:12 Another effort by a British company, between 1888 and 1892, also proved to be unsuccessful. When the New York and Jersey Tunnel Company resumed construction on the uptown tubes in 1902, chief engineer Charles M. Jacobs employed a different method of tunneling. He pushed a shield through the mud and then placed tubular cast iron plating around the tube. As the northern tube of the uptown tunnel was completed shortly after the resumption of construction, the southern tube was constructed using the tubular cast iron method. Construction of the uptown tunnel was completed in 1906. By the end of 1904, the New York and Jersey Railroad Company had received permission from the New York City Board of Rapid Transit Commissioners to build a new subway line through Midtown Manhattan, which would connect with the Uptown Hudson Tubes; the company received the sole rights to operate this line for a duration of 25 years. The Midtown Manhattan line would travel eastward under Christopher Street before turning northeastward under Sixth Avenue, then continue underneath Sixth Avenue to a terminus at 33rd Street. In January 1905, the Hudson Companies was incorporated for the purpose of completing the Uptown Hudson Tubes and constructing the Sixth Avenue line. The company, which was contracted to construct the Uptown Hudson Tubes' subway tunnel connections on each side of the river, already had a capital of $21 million. The H&M was incorporated in December 1906 to operate a passenger railroad system between New York and New Jersey via the Uptown and Downtown Tubes. A second pair of tunnels, the current Downtown Hudson Tubes, was built about 1 1⁄4 miles (2.0 km) south of the first pair. Construction began in 1906 and was completed in 1909, also using the tubular cast iron method. :18 The uptown and downtown tunnels both consisted of two tubes, which each contained a single unidirectional track. The eastern ends of the tunnels, located underneath Manhattan, employed cut and cover construction methods. Park Place Station in Newark was the H&MRR's terminus until the completion of Newark Penn Station in the late 1930s. Test runs of trains without passengers started through the tunnels in late 1907. Revenue service started between Hoboken Terminal and 19th Street at midnight on February 26, 1908, after President Theodore Roosevelt pressed a button at the White House that turned on the electric lines in the uptown tubes; the "official" first train had occurred the previous day, but was open only to selected officials. :21 This became part of the current Hoboken–33rd Street line. :2 The H&M system was powered by a 650-volt direct current third rail, which in turn drew power from an 11,000-volt transmission system with three substations. The substations were the Jersey City Powerhouse, as well as two smaller substations at the Christopher Street and Hudson Terminal stations. An extension of H&M from 19th Street to 23rd Street opened on June 15, 1908. On July 19, 1909, service began between the Hudson Terminal in Lower Manhattan and Exchange Place in Jersey City, through the downtown tubes. The connection between Exchange Place and the junction near Hoboken Terminal opened on August 2, 1909, and trains started running on the Hoboken–Hudson Terminal line. :3 A new line running between 23rd Street and Hudson Terminal was created on September 20, 1909.:3 On September 6, 1910, the H&M was extended from Exchange Place west to Grove Street, and the 23rd Street–Hudson Terminal line was rerouted to Grove Street, becoming part of the current Journal Square–33rd Street line. A fourth line, Grove Street–Hudson Terminal (now the Newark–World Trade Center line), was also created. :3 On November 10 of that year, the Hoboken-23rd Street and Grove Street-23rd Street lines were extended from 23rd Street to 33rd Street. The H&M's Grove Street–Hudson Terminal line was extended west from Grove Street to Manhattan Transfer on October 1, 1911, and then to Park Place in Newark on November 26 of that year. After completion of the uptown Manhattan extension to 33rd Street and the westward extension to the now-defunct Manhattan Transfer and Park Place Newark terminus in 1911, the H&M's track mileage had essentially been fully built. :7 The final cost was estimated at $55–$60 million ($1,534,000,000 to $1,673,000,000 today). A stop at Summit Avenue (now Journal Square), located between Grove Street and Manhattan Transfer, opened on April 14, 1912, as an infill station on the Newark-Hudson Terminal line, though only one platform was in use at the time. The Summit Avenue station was completed on February 23, 1913, allowing service from 33rd Street to terminate there. :7 The last station, at Harrison, opened on March 6, 1913. Originally, the Hudson Tubes were designed to link three of the major railroad terminals on the Hudson River in New Jersey—the Erie Railroad (Erie) and Pennsylvania Railroad (PRR) in Jersey City and the Delaware, Lackawanna and Western Railroad (DL&W) in Hoboken—with New York City. While PATH still provides a connection to train stations in Hoboken and Newark, the Erie's Pavonia Terminal at what is now Newport and the PRR terminal at Exchange Place station were both eventually closed and subsequently demolished. There were early negotiations for New York Penn Station to also be shared by the two railroads. In 1908, McAdoo proposed to build an additional branch of the H&M southward to Communipaw, so that there would be a transfer to the Central Railroad of New Jersey Terminal there. In September 1910, McAdoo proposed another expansion, consisting of a second north-south line through Midtown Manhattan. The line's southern terminus would be located at Hudson Terminal, and its northern terminus would be at 33rd Street and Sixth Avenue, underneath Herald Square and near the H&M's existing 33rd Street station. The new north-south line, which would be 4 miles (6.4 km) long, would run mainly under Broadway, although a small section of the line near Hudson Terminal would run under Church Street. Under McAdoo's plan, the city could take ownership of this line within 25 years of its completion. That November, McAdoo also proposed that the two-track Broadway line be tied into the IRT's original subway line in Lower Manhattan. The Broadway line, going southbound, would merge with the local tracks of the IRT's Lexington Avenue line in the southbound direction at 10th Street. A spur off the Lexington Avenue line in Lower Manhattan, in the back of Trinity Church, would split eastward under Wall Street, cross the East River to Brooklyn, then head down Fourth Avenue in Brooklyn, with another spur underneath Lafayette Avenue. McAdoo wanted not only to operate what was then called the "Triborough System", but also the chance to bid on the Fourth Avenue line in the future. The franchise for the Broadway line was ultimately awarded to the Brooklyn Rapid Transit Company (BRT) in 1913, as part of the Dual Contracts. The first section of the BRT's Broadway line opened in 1917, and that line was completed by 1920. The BRT was also given the franchise for the Fourth Avenue line in Brooklyn as part of the Dual Contracts. The BRT's Fourth Avenue line opened in stages from 1915 to 1925. In 1909, McAdoo considered extending the H&M in New Jersey, building a branch north to Montclair and Essex County. A route extending north from Newark would continue straight to East Orange. From there, branches would split to South Orange in the south and Montclair in the north. In the 1930s, service to the Uptown Hudson Tubes in Manhattan was affected due to the construction of the Independent Subway System (IND)'s Sixth Avenue Line. The 33rd Street terminal closed on December 26, 1937 and service on the H&M was cut back to 28th Street to allow for construction on the subway to take place. The 33rd Street terminal was moved south to 32nd Street and reopened on September 24, 1939. The city had to pay $800,000 to build the new 33rd Street station and reimbursed H&M another $300,000 to the H&M for the loss of revenue. The 28th Street station was closed at this time because the southern entrances to the 33rd Street terminal were located only two blocks away, rendering the 28th Street stop unnecessary. It was demolished to make room for the IND tracks below. The Manhattan Transfer station was closed on June 20, 1937, and H&M was realigned to Newark Penn Station from the Park Place terminus a quarter-mile north; the Harrison station across the Passaic River was moved several blocks south as a result. On the same day, the Newark City Subway was extended to Newark Penn Station. The upper level of the Centre Street Bridge to Park Place later became Route 158. Promotions and other advertising proved ineffectual at slowing the financial decline of the H&M. The 19th Street station in Manhattan was closed in 1954. The same year, the H&M entered receivership due to a consistent loss of revenue. It operated under bankruptcy protection for years and received a tax cut in 1956. That year, the H&M saw 37 million annual passengers, and transportation experts called for subsidies to help keep H&M solvent. One expert proposed making a "rail loop", with the Uptown Hudson Tubes connecting to the IND Sixth Avenue Line, then continuing up Sixth Avenue and west via a new tunnel to Weehawken, New Jersey. By 1958, the H&M recorded 30.46 million annual passengers. Two years later, creditors approved a tax plan to reorganize the company. During this time, H&M workers went on strike twice due to wage disputes: in 1953 for two days, and in 1957 for a month. The planning of the World Trade Center in the early 1960s enabled a compromise between the Port Authority and the states of New York and New Jersey. The Port Authority agreed to purchase and maintain the Tubes in return for the rights to build the World Trade Center on the land occupied by H&M's Hudson Terminal, which was the Lower Manhattan terminus of the Tubes. A formal agreement was made in January 1962. On April 1 of the same year, the Port Authority set up two subsidiary corporations: the Port Authority Trans-Hudson Corporation (PATH) to operate the H&M tubes, as well as another subsidiary to operate the World Trade Center. The Port Authority of New York and New Jersey would have been bound under federal Interstate Commerce Commission rules if it ran the trains directly, but with the creation of the PATH Corporation, only the subsidiary's operations would be federally regulated. On September 1, 1962, PATH formally took over operation of the H&M Railroad and the Tubes. :58 Upon taking over the H&M Railroad, the Port Authority spent $70 million to modernize its infrastructure. The Port Authority also repainted H&M stations into the new PATH livery. In 1964, the Port Authority ordered 162 PA1 railway cars to replace the H&M rolling stock. The first PA1 cars were delivered in 1965. Subsequently, the agency ordered 44 PA2 cars in 1967 and 46 PA3 cars in 1972. The Hudson Terminal was located on the future site of the World Trade Center. As part of the World Trade Center's construction, the Port Authority decided to demolish the Hudson Terminal and construct a new World Trade Center Terminal on the site. Groundbreaking on the World Trade Center took place in 1966. During excavation and construction, the original Downtown Hudson Tubes remained in service as elevated tunnels. The new World Trade Center Terminal was opened on July 6, 1971, at a different location from the original Hudson Terminal. The new station cost $35 million to build, and saw 85,000 daily passengers at the time of its opening. At this time, the Hudson Terminal was shut down. In January 1973, the Port Authority released plans to double the length of the PATH system. The plan called for a 15-mile (24 km) extension of the Newark–World Trade Center line from Newark Penn Station to Plainfield, New Jersey. A stop at Elizabeth would allow the PATH to serve Newark Airport as well. At the Newark Airport stop, there would be a transfer to a people mover to the terminals themselves. Preliminary studies of the right-of-way, as well as a design contract, were conducted that year. This 15-mile (24 km) extension was approved in 1975. However, the Federal Urban Mass Transit Administration was wary of the proposed extension's usefulness and was reluctant to give the $322 million in funds that the Port Authority had requested for the project, which represented about 80% of the projected cost at the time. Eventually, the administration agreed to back the PATH extension. However, the Supreme Court of the United States ruled that the Port Authority's use of bonds to finance the extension was not permitted, significantly setting back the project. In June 1978, the extension, then estimated to cost $600 million, was canceled completely in favor of improved bus service in New Jersey. Also in 1973, PATH workers went on strike due to union disagreements with the Port Authority. A strike had been avoided in January 1973, but talks subsequently failed and workers walked out that April 1. The 1973 strike had been caused by a dispute over salary increases that the Port Authority was unwilling to grant. Negotiations between workers and the Port Authority broke down as the strike extended past one month. The strike ended on June 2, 1973, sixty-three days after it had begun. The 1980 New York City transit strike suspended transit service on the New York City Transit Authority (NYCTA)'s bus and subway routes from April 1 to 11. A special PATH route ran from 33rd Street to World Trade Center via Midtown Manhattan, Pavonia–Newport, and Exchange Place during the NYCTA strike. PATH motormen also threatened to go on strike during this time, but this was unrelated to the NYCTA strike. The special service was suspended during April 8, a Tuesday, because some workers refused to voluntarily operate trains during their overtime hours. On June 12, 1980, PATH workers again went on strike for the same reason as in 1973, marking the first walkout since then. During the strike, moisture built up within the tunnels and rust accumulated on the tracks, although the pumps in the underwater tunnels were still operating so that the tubes would not be flooded completely. Alternative service across the Hudson River was provided by shuttle buses through the Holland Tunnel, though it was described as "inadequate". The 1980 strike, which lasted 81 days and ended on September 1, was the longest in PATH's history. During the 1980s, the PATH system experienced substantial growth in ridership, which meant the infrastructure needed expansion and rehabilitation. The Port Authority announced a plan in 1988 to upgrade the infrastructure so that stations on the Newark–WTC line could accommodate longer 8-car trains while 7-car trains could operate between Journal Square and 33rd Street. In August 1990, the Port Authority put forth a $1 billion plan to renovate the PATH stations and add new rail cars. To help provide revenue, the Port Authority installed video monitors in its stations that display advertising. At that time, the Port Authority incurred a $135 million deficit annually, which it sought to alleviate with a fare hike to reduce the per passenger subsidy. By 1992, the Port Authority had spent $900 million on infrastructure improvements, including repairing tracks; modernizing communications and signaling; replacing ventilation equipment; and installing elevators at seven stations as part of the Americans with Disabilities Act of 1990. A new car maintenance facility was also added in Harrison, at a cost of $225 million, and opened circa 1990. It replaced PATH's old Henderson Street Yard—a below-grade, open-air train storage yard at the northeast corner of Marin Boulevard and Christopher Columbus Drive just east of the Grove Street station—which was closed on October 12, 1990. On December 11, 1992, a coastal storm caused high tides, which led to extensive flooding in the PATH tunnels. Most trains were stopped before reaching the floodwaters, but one train became stalled near Hoboken Terminal. A 2,500–3,000-foot (760–910 m) section of track between Hoboken and Pavonia was flooded, as were other locations within the system. Some water pumps within the PATH system failed because there was too much water entering the system at once. The Newark–World Trade Center service was not disrupted in the aftermath of the flood, but the Journal Square–33rd Street service was forced to slow down because several spots along the route needed to be pumped out. Service to Hoboken was suspended for ten days, the longest period of disruption since the summer 1980 strike. When the World Trade Center bombing occurred on February 26, 1993, a section of ceiling in the PATH station collapsed and trapped dozens. Nonetheless, the PATH station did not suffer any structural damage. Within three days, the Port Authority was able to resume PATH service to the World Trade Center. In the summer of 1993, the Port Authority banned tobacco advertisements in all trains and stations. The Port Authority had earned $161,000 from these advertisements in the previous year. A new car wash for the train cars opened in mid-September 1993 in Jersey City, replacing the old wash on Track 1 at the 33rd Street terminal. The new wash was computer-operated, and was designed to reclean and recycle the water used in the operation. More space for the operation was provided at Jersey City, allowing the detergent used on the cars to have more time to take effect. At 33rd Street, brushes began scrubbing the cars very soon after the detergent went on. The new facility was designed to give about a minute to allow the detergent to work, helping better clean the cars. The project allowed the Port Authority to deactivate the car wash at 33rd Street, providing more flexibility in terminal operations at the station. In April 1994, a new entrance to the Exchange Place was opened making the station ADA accessible. The new entrance was glass-enclosed and featured two elevators which led to a lower-level passageway 63 feet (19 m) down, from where another elevator went down the short distance to platform level. On April 29, 1996, three trains began running express on the Newark–World Trade Center service for six months, cutting running time by 3.5 minutes. Weekend Hoboken–World Trade Center service began on October 27, 1996 on a six-month trial basis, and express Newark–World Trade Center service was made permanent the same day. With the World Trade Center station destroyed, service to Lower Manhattan was suspended indefinitely. Exchange Place, the next-to-last station before World Trade Center, was closed as well because it could not operate as a terminal station; the tracks could not turn back trains into the opposite direction. The Exchange Place station also suffered severe water damage during the attacks. A temporary PATH terminal at the World Trade Center was approved in December 2001 and was set to open within two years of that date. PATH service to Lower Manhattan was restored when a new, $323 million second station opened on November 23, 2003; the inaugural train was the same one that had been used for the evacuation. :108–110 The second, temporary station contained portions of the original station, but did not have heating or air conditioning systems installed. The temporary entrance was closed on July 1, 2007, and demolished to make way for the third, permanent station; around the same time, the Church Street entrance opened. A new entrance on Vesey Street opened in March 2008, and the entrance on Church Street was then demolished. On July 7, 2006, an alleged plot to detonate explosives in the PATH's Downtown Hudson Tubes (initially said to be a plot to bomb the Holland Tunnel) was uncovered by the FBI. According to officials, this plan was unsound due to the strength of both tunnels, as well as various restrictions in both the Holland Tunnel and the PATH system. Of the eight planners based in six different countries, three were arrested. At 12:01 am on October 29, 2012, PATH service was suspended system-wide in advance of Hurricane Sandy. The following day, New Jersey Governor Chris Christie stated that PATH train service would be out for 7–10 days as a result of the damage caused by the hurricane. Storm surge from the hurricane caused significant flooding to PATH train stations in Hoboken and Jersey City, as well as at the World Trade Center. An image captured from a PATH security camera showing the ingress of water at Hoboken at 8:23 p.m. on October 29, quickly spread across the Internet and became one of several representative images from the hurricane. The first revenue PATH trains after the hurricane were the Journal Square–33rd Street service, which recommenced on November 6 and ran only during the daytime. Service was extended west to Harrison and Newark on November 12, in place of the Newark–World Trade Center service. Christopher Street and 9th Street were reopened during the weekend of November 17–18, but remained closed for the following five weekdays. Normal weekday service on the Newark–World Trade Center and Journal Square–33rd Street lines resumed on November 26. On weekends, trains operated using the Newark–33rd Street service pattern. The Hoboken station suffered major damage after as much as eight feet (2.4 m) of water submerged the tunnels, and had to stay closed for several weeks for $300 million worth of renovations. The Newark–33rd Street route was suspended for two weekends in mid-December, with the Newark–World Trade Center running in its place, in order to expedite the return of Hoboken service. As a result, Hoboken Terminal reopened on December 19 for weekday daytime Hoboken–33rd Street service, followed by the resumption of weekday 24-hour PATH service on January 9, 2013. The Hoboken–World Trade Center trains resumed on January 29, and the pre-Hurricane Sandy service patterns were restored by the weekend of March 1. However, the Downtown Hudson Tubes were severely damaged in Hurricane Sandy. As a result, to accommodate repairs, service on the Newark–World Trade Center line between Exchange Place and World Trade Center was to be suspended during almost all weekends, except for holidays in 2019 and 2020. The construction of the permanent four-platform World Trade Center Transportation Hub started in July 2008, when the first prefabricated "ribs" for the pedestrian walkway under Fulton Street were installed on the site. Platform A, the first platform of the permanent station, opened February 25, 2014, serving Hoboken-bound riders. Platform B and the remaining half of Platform A opened a year later on May 7, 2015. The Oculus headhouse partially opened to the public on March 3, 2016, marking the opening of the hub. Platforms C and D, the last two platforms in the station, were opened on September 8 of that year. The Port Authority also began reconstructing the Harrison station in New Jersey in 2009. The station will feature longer and wider platforms to allow 10-car trains; street-level-to-platform elevators within the platform extensions, in compliance with the Americans with Disabilities Act of 1990; and architectural modifications to its appearance. The westbound platform of the new Harrison station opened to the public on October 30, 2018. However, the eastbound platform's opening was delayed until June 2019. In January 2010, Siemens announced that PATH would be spending $321 million to upgrade its signal system to use communications-based train control (CBTC), using Siemens' Trainguard MT CBTC, to accommodate anticipated growth in ridership. The CBTC system would replace a fixed-block signaling system, which involved signals placed beside the track and was four decades old at the time. The system would reduce the headway time between trains, so that more trains could run during rush hours, reducing passenger wait times. Trainguard MT CBTC would equip the tracks and 130 of the 340 PA5 cars being constructed by Kawasaki Railcar. The goal was to increase passenger capacity from the current 240,000 passengers to 290,000 passengers per day. The entire system was originally expected to become operational in 2017. The entire initial order of 340 PA5 cars was completed in 2011. An additional 60 PA5 cars were purchased in two subsequent optional orders. In conjunction with the CBTC upgrade, the Port Authority spent $659 million to upgrade thirteen platforms on the Newark–World Trade Center line so that they could accommodate 10-car trains; prior to the upgrade, the line could only run eight-car-long trains. The Federal Railroad Administration also mandated that all railroads in the United States have positive train control, another railroad safety system, installed on their trackage by December 31, 2018. The installation of this system on the PATH was done concurrently with the installation of the CBTC signaling system, and by 2017, the PATH was ahead of schedule on its installation of positive train control. The Newark–World Trade Center line west of Journal Square was converted to positive train control operation in April 2018, followed by the segments of track east and west of Journal Square in May 2018. This led to delays across the entire system when conductors had to slow down and manually adjust their trains to switch between the two signaling systems. Positive train control would be tested on the Uptown Hudson Tubes from July to October 2018, and the entire system would be converted by December. This meant that the Uptown Hudson Tubes were closed for most weekends in mid-2018. The positive train control upgrade for the PATH system was finished at the end of November 2018, a month ahead of schedule. The Port Authority is also installing two amenities in all PATH stations. Cellphone service at the nine underground stations was added for AT&T and T-Mobile customers in November 2018, to be followed by corresponding service for Verizon and Sprint customers in early 2019. Additionally, "countdown clocks", which display the duration until the next train arrives, would be installed in all PATH stations by 2019. In the mid-2000s, a Newark Airport extension was again considered as the Port Authority allocated $31 million to conduct a feasibility study of extending PATH two miles (3.2 km) from Newark Penn Station. In September 2012, it was announced that work would commence on the study. The study estimated in 2004 the cost of the extension at $500 million. On September 11, 2013, Crain's reported that New Jersey Governor Chris Christie would publicly support the PATH extension; its estimated cost grew to $1 billion. The governor asked that the airport's largest operator, United Airlines, consider flying to Atlantic City International Airport as an enticement to further the project. On February 4, 2014, the Port Authority proposed a 10-year capital plan that included the PATH extension to Newark Liberty International Airport Station. The Board of Commissioners approved the Capital Plan, including the airport extension, on February 19, 2014. Plans include a planned $1.5 billion PATH extension to Newark Liberty International Airport. The alignment will follow the existing Northeast Corridor approximately one mile further south to the Newark Airport station, where a connection to AirTrain Newark is available. At the time, construction was expected to begin in 2018 and last five years. However, in late 2014, there were calls for reconsideration of Port Authority funding priorities. The PATH extension followed the route of existing Manhattan-to-Newark Airport train service (on NJ Transit's Northeast Corridor Line and North Jersey Coast Line as well as Amtrak's Keystone Service and Northeast Regional). On the other hand, there was no funding for either the Gateway Tunnel, a pair of commuter train tunnels that would supplement the North River Tunnels under the Hudson River, or the replacement of the aging and overcrowded Port Authority Bus Terminal. In December 2014, the PANYNJ awarded a three-year, $6 million contract to HNTB to perform cost analysis on the Newark Airport extension. On January 11, 2017, the PANYNJ released its 10-year capital plan that included $1.7 billion for the extension. Under the updated plan, construction was projected to start in 2020, with service in 2025. Two public meetings on the project were held in early December 2017. According to a presentation shown at these meetings, the new PATH station would include a park-and-ride lot as well as a new entrance to the station from the nearby Dayton neighborhood. PATH operates 24 hours a day, seven days a week. During weekday hours, PATH operates four train services, using three terminals in New Jersey and two in Manhattan. These services are direct descendants of the four original services operated by the H&M. During late nights, weekends and holidays, PATH operates two services from two terminals in New Jersey and two in Manhattan. Each line is represented by a unique color, which also corresponds to the color of the lights on the front of the trains. The Journal Square–33rd Street (via Hoboken) service is the only line represented by two colors (orange and blue), since it is a late-night/weekend/holiday combination of the Journal Square–33rd Street and Hoboken–33rd Street services. During peak hours, trains operate every four to eight minutes on each service. Every PATH station except Newark and Harrison is served by a train every two to three minutes, for a peak-hour service of 20 to 30 trains per hour. PATH management has two principal passenger outreach initiatives: the "PATHways" newsletter, distributed for free at terminals, as well as the Patron Advisory Committee. In 2018[update], PATH saw 81,733,402 passengers. On average, the system was used by 280,859 passengers per weekday; 112,768 per Saturday; 83,100 per Sunday; and 121,227 per holiday. The busiest station was World Trade Center, while the least busy station was 9th Street. The 2018 ridership was down by around one million compared to 2017, but ridership was still nearly a record for PATH operation, having increased 10 million from 2013. PATH loses about $400 million per year, and is subsidized by the Port Authority from surpluses at its other operations, such as airports and seaports. Prior to 2006, Hoboken–World Trade Center and Journal Square–33rd Street services were offered on Saturday, Sunday, and holidays between 9:00 a.m. and 7:30 p.m. On April 9, 2006, these services were indefinitely discontinued at those times, being replaced with the Journal Square–33rd Street (via Hoboken) service. Passengers wanting to travel on the Hoboken–World Trade Center route were told to take the Journal Square–33rd Street service to Grove Street and transfer to the Newark–World Trade Center train. PATH does not normally operate directly from Newark to Midtown Manhattan; passengers traveling between those points are normally told to transfer to the Journal Square-33rd Street train at either Journal Square or Grove Street. However, after both 9/11 and Hurricane Sandy, special Newark–33rd Street services were operated to compensate for the loss of other lines and stations. An intrastate Journal Square–Hoboken service was also operated after the 9/11 attacks. The Journal Square–Hoboken and Newark–33rd Street services instituted after 9/11 were canceled by 2003. From July to October 2018, because of positive train control installation on the Uptown Hudson Tubes, the Journal Square–33rd Street (via Hoboken) service was suspended on most weekends. In the meantime, it was replaced by the Journal Square–World Trade Center (via Hoboken) and the restored Journal Square–Hoboken services, since all stations between Christopher and 33rd Streets were closed during the weekends. The lengths of trains on all lines except the Newark–World Trade Center line are limited to seven cars. This is because the platforms at Hoboken, Christopher Street, 9th Street, and 33rd Street can only accommodate seven cars and cannot be extended. The Newark–World Trade Center line can accommodate trains composed of up to eight cars. In 2009, the Port Authority started upgrading platforms along that line so that it could accommodate 10-car trains. 28th Street Closed November 10, 1910 Closed September 24, 1939 when the 33rd Street station was extended southward. Hudson Terminal Closed July 19, 1909 Closed in 1971 when service opened to World Trade Center. NYCT Bus, MTA Bus Closed from September 11, 2001 to November 23, 2003. All terminals (33rd Street, Hoboken, World Trade Center, Journal Square and Newark) are compliant with the Americans with Disabilities Act of 1990, as are Exchange Place, Grove Street, and Pavonia/Newport. Harrison is currently undergoing reconstruction and will also become accessible, scheduled for completion in 2018. When this project is completed, only four stations will not be accessible to wheelchair users, all of which will be in New York City. The Port Authority charges a single flat fee to ride the PATH system, regardless of distance traveled. As of October 1, 2014[update], a single PATH ride is $2.75; two-trip tickets are $5.50; 10-trip, $21; 20-trip, $42; 40-trip, $84 ($2.10 per trip); a seven-day unlimited, $29; and a 30-day unlimited, $89. Single ride tickets are valid for two hours from time of purchase. While some PATH stations are adjacent to or connected to New York City Subway, Newark Light Rail, Hudson-Bergen Light Rail, and New Jersey Transit stations, there are no free transfers between these different, independently run transit systems. The H&M formerly used a tier-based fare system where a different fare was paid based on where the passenger was traveling. For instance, prior to September 1961, an interstate fare to or from all stations except Newark Penn Station cost 25 cents, while an intrastate fare cost 15 cents. That month, the interstate fare was increased to 30 cents, and the intrastate fare to 20 cents. A fare to or from Newark Penn, regardless of the origin or destination point, was 40 cents because the station's operations were shared with the Pennsylvania Railroad at the time. Under Port Authority operation, the PATH fare to and from Newark was lowered in 1966, standardizing the interstate fare to 30 cents. The intrastate fare of 15 cents was doubled in 1970, effectively standardizing the fare for all trips to a flat rate of 30 cents. PATH fares were paid with brass tokens starting in 1965. The Port Authority ordered 1 million tokens in 1962 and bought a half-million more in 1967. The Port Authority discontinued the sale of tokens in 1971 as a cost-cutting measure, since it cost $900,000 a year to maintain the token fare system. The agency replaced 175 turnstiles in the PATH's 13 stations with new turnstiles that accepted the 30-cent fare in exact change. A PATH fare was formerly payable with a paper ticket called the QuickCard. QuickCards, introduced in June 1990, were only valid on the PATH system. They were magnetic stripe cards wherein the fare information is stored on a magnetic stripe on the front of the card. The QuickCard was phased out in 2008 with the introduction of the SmartLink. QuickCard sales ceased at most PATH stations in early 2008; at NJ Transit ticket machines in NJ Transit stations since November 30, 2008; and at ticket machines in major PATH transfer stations since December 31, 2008. By late 2008, PATH had completed the deactivation of all turnstiles that accepted cash (in addition to the QuickCard, MetroCard and SmartLink card). These turnstiles continued to accept the various cards as fare payment. After the QuickCard was discontinued, it was replaced by SmartLink Gray, a non-refillable, disposable version of the SmartLink card. This card was sold at selected newsstand vendors and was available in 10, 20 and 40 trip increments. Unlike regular SmartLink cards, SmartLink Gray cards had expiration dates. SmartLink Gray was itself discontinued in January 2016. The PATH's official method of fare payment is a smart card known as SmartLink. The SmartLink was developed at a cost of $73 million, and initially was intended as a regional smart card that could be deployed on transit systems throughout the New York metropolitan area. The rollout of the SmartLink started in July 2007 when it was first made available at the World Trade Center. The SmartLink can be connected to an online web account system allowing a cardholder to register the card and monitor its usage. The SmartLink allows for an automatic replenishment system linked to a credit card account, wherein the card balance is automatically refilled upon reaching a threshold of 5 trips remaining (for multiple-trip cards) or 5 days remaining (for unlimited-ride cards). SmartLink turnstiles at the WTC station accept both PATH SmartLink cards and MTA MetroCards. PATH fare payment may also be made using single-ride, two-trip, and pay-per-ride MetroCards, the standard farecard operated by the Metropolitan Transportation Authority (MTA). The MetroCard is a magnetic stripe card, like the now defunct QuickCard. PATH riders paying their fare using MetroCard insert the card into a slot at the front of the turnstile, which reads the card and presents the MetroCard to the rider at a slot on the top of the same turnstile. Other types of MetroCards, including unlimited-ride MetroCards, are not accepted on the PATH. Plans for using the MetroCard on the PATH date to 1996, when the Port Authority and MTA considered a unified fare system for the first time. At the time, the MetroCard was still being rolled out on the MTA system, and more than 80% of PATH riders transferred to other modes of transportation at some point in their trip. In November 2003, the Port Authority announced that the MetroCard would be allowed for use on the PATH starting the following year. The Port Authority started implementing the MetroCard on the PATH in 2005, installing new fare collection turnstiles at all PATH stations. These turnstiles allowed passengers to pay their fare with a PATH QuickCard or an MTA Pay-Per-Ride MetroCard. MetroCard vending machines are located at all PATH stations. The machines sell Pay-Per-Ride MetroCards; allow riders to refill SmartLink cards; and sell Single Ride PATH tickets for use only on the PATH system. There are two types of MetroCard vending machines: large machines, which sell both MetroCards and SmartLinks and accept cash, credit cards, and transit benefits cards; and small machines, which do not accept cash or sell PATH single-ride tickets but otherwise perform the same functions as the large vending machines. In 2010, PATH introduced a two-trip card costing $4.00 using the standard MetroCard form. All PATH stations, except for the uptown platforms at 14th and 23rd Streets, contain "blue vending machines" which sell this card. The front of the card is the standard MetroCard (gold and blue) but on the reverse it has the text "PATH 2-Trip Card", "Valid for two (2) PATH trips only" and "No refills on this card". The user had to dispose of the card after the trips are used up because the turnstiles do not keep (or capture) the card as was done with the discontinued QuickCard. As of 2011[update], there is only one model, the PA5. The cars are 51 feet (16 m) long by 9.2 feet (2.8 m) wide, a smaller loading gauge compared to similar vehicles in the US; this limitation is due to the restricted structure gauge through the tunnels under the Hudson River. They can achieve a maximum speed of 55 mph (89 km/h) in regular service. Each car seats 35 passengers, on longitudinal "bucket" seating, and can fit a larger number of standees in each car. PA5 cars have stainless steel bodies and three doors on each side. LCD displays above the windows (between the doors) display the destination of that particular train. The PA5 cars are coupled and linked into consists of up to ten cars long, with conductors' cabs on all cars and engineers' cabs on the "A" (driving) cars. In c. 2005, the Port Authority awarded a $499 million contract to Kawasaki to design and build 340 new PATH cars under the PA5 order, which replaced the system's entire existing fleet. With an average age of 42 years, the fleet was the oldest of any operating heavy rail line in the United States. The Port Authority announced that the new cars would be updated versions of MTA's R142A cars. The first of these new cars entered revenue service July 10, 2009. All 340 cars were delivered by 2011. The Port Authority exercised a subsequent contract for 10 additional PA5 cars, bringing the total to 350. As part of the fleet expansion program and signal system upgrade, the Port Authority has the option to order a total of 119 additional PA5 cars as the option order; 44 of these cars would be to expand the NWK–WTC line to 10-car operation while the remaining 75 cars would be used to increase service frequencies once communication-based train control (CBTC) is implemented throughout the system by the end of 2018. In December 2017, the Port Authority exercised an option to buy fifty extra PA5 cars for $150 million, for an ultimate total of 400 PA5 cars. Subsequently, in July 2018, Kawasaki was awarded a $240 million contract to refurbish the 350 existing PA5 cars between 2018 and 2024. The contract also called for Kawasaki to build and deliver 72 new PA5 cars starting in 2021, for a total of 422 cars. The trains are stored and maintained at the Harrison Car Maintenance Facility in New Jersey, located east of the Harrison station. Another train storage yard exists east of the Journal Square Station. If the Newark Airport extension is built, a third train storage yard would be built there. Before Port Authority takeover, the H&M system used rolling stock series that were given letters from A to J. All of these cars, except for the D and H series, were known as "black cars" because they were painted black. :6 There were a total of 325 cars in series A through J, of which 255 were black cars. :6 The first 190 cars, in classes A through C, were ordered for the initial H&M service and delivered in 1909–1911. The cars, which were built in seven modular segments, measured 48.25 feet (14.71 m) long with a loading gauge of 8.83 feet (2.69 m) and a height of 12 feet (3.7 m), with longitudinal seating and three doors on each side. They were ordered to the narrow specifications of the Hudson Tubes, and were light enough that they could be tested on the Second Avenue elevated in Manhattan, which could only support lightweight trains. :2 Seventy-five cars in classes E through G were added in 1921–1923, allowing the H&M to lengthen train consists from 6–7 cars each to 8 cars each. Although classes E-G had similar exterior dimensions to classes A-C, the E-G series had higher capacity, were heavier, and had substantially different window designs compared to the A-C series. :6 The last order of black cars, the 20 cars in series J, was delivered in 1928.:6–7 Many of the black cars remained in service from their inception until the H&M's bankruptcy in 1954. By that time, the black cars required large amounts of maintenance. The PRR and H&M joint service comprised 40 cars in classes D and H, which were owned by the H&M, as well as 72 cars from the MP38 class, which were owned by the PRR. Sixty MP38s and 36 Class D cars were delivered in 1911, when the service first operated. :43 In 1927, an additional twelve MP38 cars were ordered under the MP38A classification, as well as four Class H cars. :6 As a result of the different manufacturers and the long duration between the two pairs of orders, the Class D and MP38 cars' designs were noticeably different from the Class H and MP38A cars' designs. :6–7 The red cars were branded with the names of both companies to signify the partnership. The red cars suffered from corrosion and design defects, and were unusable by 1954. All of the red and black car series were designed to be operationally compatible, which meant that a train consist could be made up of cars from any of the series. The MP52 and K-class, which replaced the D-class and the 60 MP38s ordered in 1911, comprised an order of 50 cars. The MP52 (30 cars) and K-class (20 cars) were purchased by the PRR and H&M respectively and delivered in 1958 in order to save money on the maintenance of the existing cars. PA1, PA2, and PA3 cars had painted aluminum bodies, and two doors on each side. Back-lit panels above the doors displayed the destination of that particular train: HOB for Hoboken, JSQ for Journal Square, NWK for Newark, 33 for 33rd Street, and WTC for World Trade Center. :81 In the mid-1980s, Kawasaki overhauled 248 of the 252 PA1-PA3 cars at their factory in Yonkers, New York, and repainted these cars white to match the PA4 cars being delivered at the time. :81 PA4 cars had stainless steel bodies, and three doors on each side. Back-lit displays above the windows (between the doors) displayed the destination of that particular train. :81 All four series were designed to be operationally compatible. Although all four orders contained "A" cars with cabs at one end, the PA1 and PA2 orders also contained some "C" cars. The ends of a train had to comprise an "A" car, but an even number of "A" cars and a variable number of "C" cars could be placed in the middle of the consist. This meant that, for instance, consists of cars coupled in A-A-A-A, A-C-C-A, or A-A-A-C-C-A sequence were operable, but not consists of cars coupled in A-A-A or A-A-C-A sequence. Trains could comprise between 3 and 8 cars. All PA1-PA4 equipment were retired from passenger service in 2009–2011. 1908 1955 Pressed Steel and American Car & Foundry painted steel (black) 200–249 50 Pressed Steel built 10 cars numbered 200–209. American Car & Foundry built the remaining 40 cars numbered 210–249. Car 318 was wrecked at 33rd Street on January 16, 1931. "Red cars" used in the H&M/PRR joint service and owned by the H&M. Car 728 was wrecked at Hudson Terminal on August 23, 1937. 1911 1964–1967 Pressed Steel painted steel (red) 1901–1960 60 "Red cars" used in the H&M/PRR joint service and owned by the PRR. 1927 1966–1967 American Car & Foundry painted steel (red) 801–804 4 "Red cars" used in the H&M/PRR joint service and owned by the H&M. 1927 1966–1967 American Car & Foundry painted steel (red) 1961–1972 12 "Red cars" used in the H&M/PRR joint service and owned by the PRR. 1928 1966–1967 American Car & Foundry painted steel (black) 501–520 20 503 at Shore Line Trolley Museum. 510 and 513 at Trolley Museum of New York. Owned by PRR and used primarily in H&M/PRR joint service, later PATH service. Owned by H&M and used primarily in H&M/PRR joint service, later PATH service. Replaced most B-J class and MP38 cars. "A" cars have cab units, "C" cars-trailers have no cabs, 2 doors per side. 143 (trailer) at Trolley Museum of New York (Kingston). Cars 139, 143, and 612 wrecked on September 11, 2001 (see below). Replaced all remaining B-J class and MP38 cars. Car 160 wrecked on September 11, 2001 (see below). All are cab units, 2 doors per side. 745 at Shore Line Trolley Museum (BERA). Cars 745 and 750 wrecked on September 11, 2001 (see below). Replaced K class and MP52 series. All are cab units, 3 doors per side. Car 845 wrecked on September 11, 2001 (see below). A PATH train consisting of cars 745, 143, 160, 845, 750, 139, and 612 was left under the World Trade Center on September 11, 2001. The collapse of the south tower largely destroyed the train; cars 745 and 143 were not positioned directly beneath the tower and were the only cars to survive the collapse relatively intact. These two cars were cleaned and placed in storage following the collapse while the remains of the rest of the train had been stripped of usable parts and scrapped. The cars were intended to be displayed in the National September 11 Memorial & Museum. However, the cars were deemed too large to be displayed in the museum; as a result, car 745 was instead donated to the Shore Line Trolley Museum, while car 143 was donated to the Trolley Museum of New York. While the PATH resembles a typical intraurban heavy rail rapid transit system, it is actually under the jurisdiction of the Federal Railroad Administration (FRA), which oversees railroads that are part of the national railroad infrastructure. PATH's predecessor, the H&M, used to share trackage with the Pennsylvania Railroad between Hudson interlocking near Harrison and Journal Square. The line also connected to Amtrak's Northeast Corridor near Harrison station and also near Hudson tower. All of these connections have since been severed, as the track layout at Hudson interlocking has been modified considerably. Despite PATH now being an isolated rail system, FRA regulations still apply to the PATH because of the PATH tracks' proximity to Amtrak trackage. The PATH also uses one bridge operated by Amtrak: the Dock Bridge near Newark Penn Station. While PATH operates under several grandfather waivers, it is required to do things not typically seen on American transit systems. Some of these include the proper fitting of grab irons to all PATH rolling stock, the use of federally certified locomotive engineers, installation of positive train control (PTC), and compliance with the federal railroad hours of service regulations. This raises the PATH's per-hour operating costs relative to other railroad systems in the New York City and Philadelphia areas. The PATH regulations as of December 20, 2015[update] state that all photography, film making, video taping, or creations of drawings or other visual depictions within the PATH system is prohibited without a permit by PATH and supervision by a PATH representative. :17 According to the rules, photographers, filmmakers, and other individuals must obtain permits through an application process. :18 Although it has been suggested that the restriction was put in place due to terrorism concerns, the restriction predates 9/11. It is thought that this ban excludes members of the general public who want to take pictures, and the photography and filmography ban only applies to commercial or professional purposes. The general public is allowed to take pictures of PATH stations and all other Port Authority facilities except in secure and off-limits areas. There have been decisions from the United States Supreme Court stating that casual photography is covered by the First Amendment of the United States Constitution. However, the case law is mixed. Under the law PATH employees may not force a casual photographer to destroy or surrender their film or images, but confiscations and arrests have occurred. Litigation following such confiscations or arrests have generally, but not always, resulted in the dropping of charges or the awarding of damages. On trains bound for Newark or Hoboken from World Trade Center, a short, zoetrope-like advertisement was formerly visible in the tunnel before entering Exchange Place. There was formerly another similar advertisement, visible from 33rd Street-bound trains between 14th and 23rd Streets near the abandoned 19th Street station. Every year, around Thanksgiving, PATH employees light a decorated Christmas tree at the switching station adjacent to the tunnel used by trains entering the Pavonia/Newport station. This tradition has continued since the 1950s when a signal operator, Joe Wojtowicz, started hanging a string of Christmas lights in the tunnel. While PATH officials were initially concerned about putting up decorations in the tunnel, they later acquiesced and the tradition continued. After the September 11 attacks, a back-lit U.S. flag was put up beside the tree as a tribute to the victims of the attacks. PATH trains and stations have occasionally been the setting for music videos, commercials, movies, and TV programs. For instance, the video for the White Stripes's song "The Hardest Button to Button" was taped at the 33rd Street station. Additionally, the premiere for season 19 of Law & Order: Special Victims Unit was filmed in the World Trade Center station. The PATH may also be used as a stand-in for the New York City Subway. On August 31, 1922, two H&M trains collided at Manhattan Transfer because of heavy fog, injuring 50 people, eight of them seriously. Another collision near the same location less than a year later, on July 22, 1923, killed one person and injured 15 others. A seven-car H&M train derailed a switch and collided with a wall at 33rd Street on January 16, 1931, injuring 19 passengers. In a similar accident on August 22, 1937, a 5-car H&M train crashed into a wall at Hudson Terminal, injuring 33 passengers. On November 26, 1938, twenty-two passengers were injured when an H&M train sideswiped a PRR engine in Kearny, east of the former Manhattan Transfer station. A similar accident happened on July 23, 1963, when a PATH train collided with a PRR engine east of Harrison, killing two passengers and injuring 28 more. On April 26, 1942, a six-car H&M train derailed at Exchange Place. Five people were killed and 222 more were injured. A subsequent investigation found that the motorman had been intoxicated at the time. On December 17, 1945, a seven-car H&M train collided with a steel barrier on the Dock Bridge west of Harrison, killing the motorman and injuring 67 passengers. A PATH train rear-ended another train at Journal Square on December 13, 1958, injuring 30 passengers, none seriously. Nine years later, on January 11, 1968, another rear-end accident at the same location injured 100 of the approximately 200 combined passengers on the two trains, 25 of them seriously. No one was killed. On October 21, 2009, a PATH train crashed into a barricade at the end of the platform at 33rd Street. Approximately 13 of the 450 people riding the seven-car train suffered minor injuries, and seven people including two crew members and five passengers were taken to nearby hospitals. An investigation by the Port Authority determined that the accident was caused by human error. In a similar crash on May 8, 2011, a PATH train crashed into a barricade at Hoboken Terminal, injuring 34 people. This crash was attributed to the train's excessive speed. A train near Exchange Place caught fire on June 3, 1982, injuring 28 people. Part of the ceiling at Journal Square fell onto the platform on August 9, 1983, killing 2 and injuring 8. On January 7, 2013, an escalator at Exchange Place suddenly reversed itself, resulting in five injuries. ^ a b c d "2018 PATH Monthly Ridership Report" (PDF). pathnynj.gov. Port Authority of New York and New Jersey. 2018. Retrieved February 4, 2019. ^ a b c "Project Detail". Port Authority of New York and New Jersey. June 25, 2012. Retrieved March 2, 2018. ^ a b c d e f g Fitzherbert, Anthony (June 1964). ""The Public Be Pleased": William G. McAdoo and the Hudson Tubes". Electric Railroaders Association, nycsubway.org. Retrieved January 9, 2012. ^ Dunlap, David W. (February 25, 2008). "Why PATH Rides Are Free Today". City Room. Retrieved April 24, 2018. ^ "Under the Hudson River by Tunnel About to Become a Reality; October 1 Will See the End of a Romance of Thirty-four Years' Struggle of Capital and Brains Against the Seemingly Insurmountable Obstacles of Nature". The New York Times. May 26, 1907. ISSN 0362-4331. Retrieved April 24, 2018. ^ a b Burr, S.D.V. (1885). Tunneling Under The Hudson River: Being a description of the obstacles encountered, the experience gained, the success achieved, and the plans finally adopted for rapid and economical prosecution of the work. New York: John Wiley and Sons. Retrieved August 24, 2009. ^ "WORK ON THE TUNNEL RESUMED". The New York Times. July 23, 1879. Retrieved April 22, 2018. ^ "TWENTY MEN BURIED ALIVE; CAVING IN OF THE HUDSON RIVER TUNNEL. THE STORY OF THE DISASTER. STORY OF A SURVIVOR. WHAT ANOTHER WORKMAN SAYS. THE LOST AND THE SAVED. WHAT THE SUPERINTENDENT SAYS. CHARACTER OF THE ENTERPRISE. WHERE THE "BLOW-OUT" OCCURRED. CONSULTATION OF ENGINEERS. WHO IS AT FAULT?". The New York Times. July 22, 1880. Retrieved April 22, 2018. ^ "THE HUDSON RIVER TUNNEL. ; EFFORT MAKING TO RAISE SUFFICIENT MONEY TO COMPLETE IT". The New York Times. March 18, 1893. Retrieved April 22, 2018. ^ "HUDSON TUNNEL OPEN END TO END; Party of Twenty Walk Under River to Jersey City. LAST HEADINGS ARE COUPLED President McAdoo Unexpectedly Summoned to Make the First Trip Through the Bore". The New York Times. March 12, 1904. ISSN 0362-4331. Retrieved April 23, 2018. ^ Gilbert, Gilbert H.; Wightman, Lucius I.; Saunders, W.L. (1912). The Subways and Tunnels of New York. John Wiley & Sons. pp. 155–159. ^ "$100,000,000 Capital for M'Adoo Tunnels". The New York Times. December 12, 1906. Retrieved December 29, 2017. ^ a b "M'ADOO SUBWAY WINS FIGHT FOR FRANCHISE; Crosstown Line Perpetual – 25 Years Under Sixth Avenue". The New York Times. December 16, 1904. ISSN 0362-4331. Retrieved April 24, 2018. ^ "$21,000,000 COMPANY FOR HUDSON TUNNELS; Will Also Build Ninth Street and Sixth Avenue Subways. FOR CENTRAL PARK ROUTE? Rapid Transit Board Hints at It in Recommending McAdoo Underground Routes to Aldermen". The New York Times. 1905. ISSN 0362-4331. Retrieved April 24, 2018. ^ The Commercial & Financial Chronicle ...: A Weekly Newspaper Representing the Industrial Interests of the United States. William B. Dana Company. 1914. ^ "$100,000,000 CAPITAL FOR M'ADOO TUNNELS; Railroad Commission Agrees to Issuance of Big Mortgage. McADOO EXPLAINS PROGRESS The Work Very Expensive, but Going on Rapidly – New Bonds to Take Up Old Issues". The New York Times. December 12, 1906. ISSN 0362-4331. Retrieved April 24, 2018. ^ Davies, John Vipond (1910). "The Tunnel Construction of the Hudson and Manhattan Railroad Company". Proceedings of the American Philosophical Society. Philadelphia: American Philosophical Society. 49 (195): 164–187. JSTOR 983892. ^ The World Almanac and Encyclopedia. Press Publishing Company (The New York World). 1911. p. 105. ^ "UNDER THE HUDSON BY TRAIN. ; First Trip Through Christopher Street Tubes to be Made To-day". The New York Times. December 18, 1907. ISSN 0362-4331. Retrieved April 24, 2018. ^ a b c d e f "Trolley Tunnel Open to New Jersey". The New York Times. February 26, 1908. p. 1. Retrieved October 27, 2008. The natural barrier which has separated New York from New Jersey since those States came into existence was, figuratively speaking, wiped away at 3:40½ o'clock yesterday afternoon when the first of the two twin tubes of the McAdoo tunnel system was formally opened, thus linking Manhattan with Hoboken, and establishing a rapid transit service beneath the Hudson River. ^ a b c d e f Chiasson, George (July 2015). "Rails Under the Hudson Revisited – The Hudson and Manhattan". Electric Railroaders' Association Bulletin. 58 (7): 2–3, 5. Retrieved April 10, 2018 – via Issuu. ^ a b c Chiasson, George (June 2015). "Rails Under the Hudson Revisited – The Hudson and Manhattan". Electric Railroaders' Association Bulletin. 58 (6): 2–3, 12, 14, 17. Retrieved April 10, 2018 – via Issuu. ^ a b "To Extend Hudson Tunnel". The New York Times. June 12, 1908. p. 6. Retrieved July 19, 2011. ^ a b c "40,000 CELEBRATE NEW TUBES' OPENING; Downtown McAdoo Tunnels to Jersey City Begin Business with a Rush. TRIP TAKES THREE MINUTES Red Fire and Oratory Signalize the Event – Speeches by Gov. Fort and Others – Ovation to Mr. McAdoo". The New York Times. July 20, 1909. ISSN 0362-4331. Retrieved April 24, 2018. ^ a b "Erie Commuters Held Up". The New York Times. August 3, 1909. p. 1. Retrieved July 19, 2011. ^ a b "Subway Station Not Closed", The New York Times, August 26, 1910, p. 6. ^ a b "M'Adoo Would Build A West Side Subway". The New York Times. September 16, 1910. p. 10. Retrieved July 19, 2011. ^ a b c "Open McAdoo Extension". The New York Times. November 10, 1910. p. 10. Retrieved July 19, 2011. ^ a b "Improved Transit Facilities by Newark High Speed Line". The New York Times. October 1, 1911. p. XX2. Retrieved July 19, 2011. ^ a b "Tube Service to Newark". The New York Times. November 26, 1911. p. 9. Retrieved July 19, 2011. ^ a b c d e f g h i j k l m n o Chiasson, George (September 2015). "Rails Under the Hudson Revisited – The Hudson and Manhattan". Electric Railroaders' Association Bulletin. 58 (9): 2–3, 6–7. Retrieved April 10, 2018 – via Issuu. ^ "Under the Hudson by Four Tubes Now". The New York Times. July 18, 1909. p. 3. Retrieved July 19, 2011. ^ Dunlap, David W. (October 26, 2008). "Another Ghost From Ground Zero's Past Fades Away". The New York Times. Retrieved October 27, 2008. The Hudson Terminal opened in 1909. Inbound trains from New Jersey approached the terminal from the south, looped along Church Street and ran outbound through a northern tube. ^ "McAdoo Co. May Use Pennsylvania Depot". The New York Times. September 2, 1908. Retrieved July 19, 2011. ^ "M'ADOO TO EXTEND HUDSON TUNNELS; Jersey Central Road to Benefit by a Branch to the Jersey City Terminal. MAIN LINES READY IN MAY When the Bores Are Completed All the Railroads with Jersey Terminals Will Have Connections". The New York Times. October 21, 1908. Retrieved June 12, 2018. ^ a b "TWO NEW SUBWAYS NOW BEING PLANNED; Interborough and McAdoo Interests Likely to Build East and West Side Systems. COMPLETE UNIFIED SYSTEM Traction Interests Disclaim Anything More Than a Tentative Interest at This Time". The New York Times. February 14, 1909. Retrieved April 24, 2018. ^ "M'ADOO SUBWAY ON TO GRAND CENTRAL; Connection Will Be Made If the Public Service Board Grants Franchise Asked For. ROUTE UNDER BRYANT PARK Scheme Will Provide Through Connections East and West by Tunnels to Jersey City and Hoboken". The New York Times. February 11, 1909. Retrieved June 12, 2018. ^ "INTER-TUNNEL SHAFT IN M'ADOO'S WAY; Connects Subway and Steinway Tunnel Through Third Level Under 42d Street. WHO AUTHORIZED IT THERE? Public Service Board Likely to Ask Questions – If It Stays, McAdoo People Must Go Lower". The New York Times. March 26, 1909. Retrieved April 24, 2018. ^ "M'ADOO EXTENSION TO BE READY IN 1911; Head of Hudson & Manhattan Road Promises It After the Board of Estimate Approves. BUSINESS MEN GRATIFIED Mr. McAdoo Also Happy – He Will Begin at Once to Complete the Jersey-Grand Central Route". The New York Times. June 5, 1909. ISSN 0362-4331. Retrieved April 24, 2018. ^ "M'ADCO READY TO RUN TRIBOROUGH; Giving a 5-Cent Ride from the Bronx to the End of the Brooklyn Extension". The New York Times. November 19, 1910. ISSN 0362-4331. Retrieved April 26, 2018. ^ Fourth Avenue Subway, Brooklyn's New Transportation Line: A Part of the Dual System of Rapid Transit of the City of New York. Public Service Commission. June 19, 1915. ^ "QUEENSBORO TUNNEL OFFICIALLY OPENED; Subway, Started Twenty-three Years Ago, Links Grand Central and Long Island City. SPEECHES MADE IN STATION Belmont, Shonts, and Connolly Among Those Making Addresses – $10,000,000 Outlay" (PDF). The New York Times. June 23, 1915. Retrieved May 4, 2017. ^ "95th St. Subway Extension Opened At 2 P. M. Today". Brooklyn Daily Eagle. October 31, 1925. Retrieved June 29, 2015 – via Newspapers.com. ^ "OPEN SUBWAY LINE TO FORT HAMILTON; Fourth Avenue Extension Put in Service After Wait of Four Years. HALF-MILE COST $2,000.000 Completion Gives Residents Through Trip Without Recourse to Trolley Cars". The New York Times. November 1, 1925. ISSN 0362-4331. Retrieved May 4, 2017. ^ "McADOO TUNNEL EXTENSION. ; Lines to the Oranges and Montclair, with Mountain Tunnels, Projected". The New York Times. March 29, 1909. ISSN 0362-4331. Retrieved April 24, 2018. ^ "TRAVEL HERE FELL 13,000,000 IN YEAR; Transit Commission Reports Drop in Railroad and Ferry Passengers in 1930. FEWER VISITED THE CITY Depression Reduced Number of Commuters—Trunk Line Roads Show the Biggest Loss. HOLLAND TUBE SET RECORD 12,066,758 Vehicles Used It—Private Ferries Carried More Autos Than in 1929. 12,066,758 Vehicles Used Tunnel. Traffic By Railroads. Comparison of Commuter Traffic". The New York Times. May 4, 1931. Retrieved April 27, 2018. ^ a b "H. & M. Fight to Win Riders A Long and Frustrating Haul". The New York Times. September 28, 1960. Retrieved June 12, 2018. ^ "Hudson Tube Opens Terminal Today–Remodeled 33d St. Station Cost City $800,000 as Part of 6th Ave. Subway Expense–Closed for Two Years–Two Train Platforms and 3 Sets of Tracks Among New Transit Equipment". The New York Times. September 24, 1939. ISSN 0362-4331. Retrieved April 15, 2018. ^ a b c "New Station Open for Hudson Tubes". The New York Times. June 20, 1937. p. 35. Retrieved July 19, 2011. ^ a b "H. & M. STATION TO CLOSE; State Authorizes Shutdown of Tube Line's 19th Street Stop". The New York Times. February 19, 1954. Retrieved April 27, 2018. ^ "HUDSON TUBES FILE BANKRUPTCY PLEA; H. & M. Line, Unable to Meet Debts, Acts to Reorganize – Losses Since '52 Cited". The New York Times. November 20, 1954. Retrieved April 27, 2018. ^ "HUDSON TUBE DEAL ON TAX APPROVED; U.S. Court Endorses Action in Favor of Railroad on City and New Jersey Claims". The New York Times. August 2, 1956. ISSN 0362-4331. Retrieved May 1, 2017. ^ "SUBSIDIES SOUGHT TO AID COMMUTING; Better Rail Links for Jersey Traffic Into City Urged by Transport Panel Tube Extension Favored". The New York Times. April 16, 1956. ISSN 0362-4331. Retrieved April 30, 2018. ^ "Creditors Back Plan to Revamp Hudson and Manhattan Railroad; CREDITORS BACK PLAN FOR H. & M." The New York Times. June 11, 1960. ISSN 0362-4331. Retrieved May 1, 2017. ^ Raskin, A. H. (May 13, 1953). "TUBE STRIKE ENDS WITH PAY ACCORD; TRAINS RUN AGAIN; Full Agreement on Retroactive Date Reached After Many Hours of Wrangling WALKOUT ON FOR 2 DAYS 70,000 Riders Readily Find Substitute Transportation by Bus, Car and Railroad TUBE STRIKE ENDED BY PAY AGREEMENT". The New York Times. ISSN 0362-4331. Retrieved April 30, 2018. ^ "TRAINS RUN AGAIN IN HUDSON TUBES; Engineers and Trainmen Go Back to Work, Obeying Federal Court Order". The New York Times. April 30, 1957. ISSN 0362-4331. Retrieved April 30, 2018. ^ Grutzner, Charles (December 29, 1961). "PORT UNIT BACKS LINKING OF H. & M. AND OTHER LINES; Favors Plan for Connections in Jersey – Trade Center Shift Is Supported PORT UNIT BACKS BIG TRANSIT PLAN". The New York Times. ISSN 0362-4331. Retrieved May 1, 2017. ^ a b Wright, George Cable (1962). "2 STATES AGREE ON HUDSON TUBES AND TRADE CENTER; New York and Jersey Settle on Bill to Permit Port Authority Operation NEW TERMINAL PLANNED Downtown H. & M. Depot to Be Erected in Conjunction With Commerce Unit Rehabilitation Due ACCORD REACHED ON HUDSON TUBES Savings Expected Boundaries Defined". The New York Times. ISSN 0362-4331. Retrieved April 30, 2018. ^ Stengren, Bernard (April 2, 1962). "PORT UNIT SETS UP SECTION FOR H.& M.; Plans Corporation to Run Railroad—Trade Center Division Also Created SEVERAL POSTS SHIFTED Neal Montanus to Head Rail Department and Guy F. Tozzoli the Trade Group To Direct Trade Center Other Responsibilities". The New York Times. ISSN 0362-4331. Retrieved April 30, 2018. ^ Wright, George Cable (January 23, 1962). "2 STATES AGREE ON HUDSON TUBES AND TRADE CENTER; New York and Jersey Settle on Bill to Permit Port Authority Operation NEW TERMINAL PLANNED Downtown H. & M. Depot to Be Erected in Conjunction With Commerce Unit Rehabilitation Due ACCORD REACHED ON HUDSON TUBES Savings Expected Boundaries Defined". The New York Times. ISSN 0362-4331. Retrieved May 1, 2017. ^ "Authority Trains Winning Plaudits". The New York Times. September 4, 1967. Five years ago, the Port of New York Authority took over the bankrupt and antiquated Hudson Tubes. Yesterday the management, employes and commuters appeared reasonably pleased with the improvements made under the Port Authority Trans-Hudson Corporation. ^ "Port Unit to Paint Stations of H. & M. On Taking Control". The New York Times. June 15, 1962. ISSN 0362-4331. Retrieved April 30, 2018. ^ a b "162 Cars Ordered for Hudson Tubes". The New York Times. 1964. ISSN 0362-4331. Retrieved April 30, 2018. ^ a b c "PATH Moves Toward All-Air-Conditioned Fleet". The New York Times. April 9, 1965. Retrieved June 13, 2018. ^ a b c d Prial, Frank J. (January 15, 1973). "PATH Aims to Grow into New Commuter Line". The New York Times. Retrieved May 1, 2018. ^ Carroll, Maurice (December 30, 1968). "A Section of the Hudson Tubes Is Turned Into Elevated Tunnel". The New York Times. ISSN 0362-4331. Retrieved April 9, 2018. ^ a b Burks, Edward C. (July 7, 1971). "New PATH Station Opens Downtown" (PDF). New York Times. p. 74. Retrieved May 30, 2010. ^ "Air-Cooled PATH Terminal in World Trade Center Opens Tuesday" (PDF). New York Times. July 1, 1971. p. 94. Retrieved May 30, 2010. ^ Carroll, Maurice (December 30, 1968). "A Section of the Hudson Tubes is Turned into Elevated Tunnel" (PDF). New York Times. p. 33. Retrieved May 30, 2010. ^ Burks, Edward C. (September 30, 1973). "PATH Is Changing Link to Airport". The New York Times. ISSN 0362-4331. Retrieved September 28, 2017. ^ Burks, Edward C. (July 8, 1973). "First Step Taken on a Rail Link to Newark Airport". The New York Times. ISSN 0362-4331. Retrieved September 28, 2017. ^ Sullivan, Ronald (February 11, 1975). "A PATH EXTENSION ORDERED BY BYRNE". The New York Times. ISSN 0362-4331. Retrieved September 28, 2017. ^ Burks, Edward C. (May 18, 1975). "U.S. Cool To PATH Plainfield Extension". The New York Times. ISSN 0362-4331. Retrieved September 28, 2017. ^ Burks, Edward C. (September 24, 1976). "U.S. Ready to Back Extension of PATH". The New York Times. ISSN 0362-4331. Retrieved September 28, 2017. ^ Sullivan, Ronald (May 8, 1977). "High Court Snags New PATH Link". The New York Times. ISSN 0362-4331. Retrieved September 28, 2017. ^ "BYRNE DROPS PLAN FOR RAIL EXTENSION". The New York Times. June 2, 1978. ISSN 0362-4331. Retrieved September 28, 2017. ^ a b "Full Impact of the Strike Against PATH Expected to Affect Commuters Today". The New York Times. April 2, 1973. Retrieved May 1, 2018. ^ Fowler, Glenn (January 3, 1973). "Nixon Averts a PATH Strike By Creating Emergency Panel". The New York Times. Retrieved May 1, 2018. ^ Malanga, Steven (April 5, 2016). "Bloated, Broke, and Bullied". city–journal.org. New Jersey On-Line. Retrieved April 6, 2017. ^ Stetson, Damon (May 1, 1973). "WALKOUT AT PATH ENTERS 2D MONTH". The New York Times. Retrieved May 1, 2018. ^ "Contract Ratified, PATH Strike By Carmen Ends After 63 Days". The New York Times. June 3, 1973. Retrieved May 1, 2018. ^ Hanley, Robert (April 4, 1980). "Thousands Find a Way Downtown Via the PATH Route to Jersey; 'A Great Convenience' Labor Troubles There, Too". The New York Times. Retrieved May 1, 2018. ^ "PATH is back, at least for now" (PDF). Yonkers Herald Statesman. April 9, 1980. p. 4. Retrieved June 15, 2018 – via Fultonhistory.com. ^ Andelman, David A. (June 12, 1980). "PATH Is Struck After Talks Fail; PATH Line Is Struck After Talks Collapse $12 Million Package Proposed Extra Service Scheduled Alternatives to PATH Travel Rail Service Strike Information Bus Service". The New York Times. Retrieved June 15, 2018. ^ a b Herman, Robin (September 1, 1980). "PATH Trains, Idle 81 Days in Strike, Rolling Again; Electrical Gear Affected". The New York Times. Retrieved June 15, 2018. ^ Hanley, Robert (July 1, 1980). "Shuttle Bus a Poor Alternative To Commuters in PATH Strike; Hoboken Fires Delay Buses". The New York Times. Retrieved June 15, 2018. ^ Associated Press (August 28, 1980). "Tentative settlement reached on PATH strike" (PDF). Nyack Journal News. p. 1. Retrieved June 15, 2018 – via Fultonhistory.com. ^ Wilson, Joyce Wells (April 1988). "No Free Rides Business". Journal of New Jersey. ^ Yarrow, Andrew L. (August 12, 1990). "Port Authority Plans Outlined". The New York Times. Retrieved June 12, 2018. ^ "THE MEDIA BUSINESS; TV Ads Are Spreading To Subways and Malls". The New York Times. January 1, 1990. Retrieved June 12, 2018. ^ Levine, Richard (February 3, 1991). "As Economy Changes, the Port Authority Must Overcome Its Own Image". The New York Times. Retrieved June 12, 2018. ^ Romano, Jay (March 15, 1992). "For PATH, On-Time Record of 90 Percent". The New York Times. Retrieved June 12, 2018. ^ Darlington, Peggy (2012). "PATH Port Authority Trans-Hudson". nycsubway.org. Retrieved April 6, 2017. ^ a b Peterson, Iver (December 20, 1992). "PATH Takes Lesson From Storm's Close Calls". The New York Times. Retrieved June 16, 2018. ^ a b Peterson, Iver (December 22, 1992). "PATH Back In Operation After Repairs". The New York Times. ^ McFadden, Robert D. (February 27, 1993). "Blast Hits Trade Center, Bomb Suspected; 5 Killed, Thousands Flee Smoke In Towers". The New York Times. ^ "Trade Center blast blamed on bomb" (PDF). Greenfield Recorder. February 27, 1993. p. 1. Retrieved June 15, 2018 – via Fultonhistory.com. ^ Marks, Peter (March 1, 1993). "PATH and Subway Service Is Being Restored". The New York Times. ^ "New Wash for PATH Cars". Pathways. Port Authority Trans-Hudson Corporation. 25 (3): 1, 3. September 1993. ^ Roberts, Donald (September 1993). "New Wash for PATH Cars". Pathways. Port Authority Trans-Hudson Corporation. 25 (3): 1–3. ^ "New Exchange Place Entrance Improves Access to Station". Pathways. Port Authority Trans-Hudson Corporation. 26 (1): 1. April 1994. ^ Pristin, Terry (April 30, 1996). "NEW JERSEY DAILY BRIEFING;Express PATH Service Begins". The New York Times. ISSN 0362-4331. Retrieved January 4, 2018. ^ Pristin, Terry (October 25, 1996). "PATH Trains Streamlined". The New York Times. ISSN 0362-4331. Retrieved January 4, 2018. ^ "Hoboken – WTC Weekend Direct Service Begins October 27". Pathways. Port Authority Trans-Hudson Corporation. 28 (2): 1, 3. October 1996. ^ "A DAY OF TERROR: SCHEDULES; Disruptions and Closings Are Expected to Continue". The New York Times. September 12, 2001. Retrieved June 16, 2018. ^ "Downtown Restoration Program – THE PORT AUTHORITY OF NY&NJ". Archived from the original on January 11, 2009. Retrieved October 22, 2014. ^ a b Weiser, Benjamin (June 29, 2003). "Closed Since 9/11, a PATH Station Is Set to Reopen Today". The New York Times. ISSN 0362-4331. Retrieved January 4, 2018. ^ Smothers, Ronald (December 14, 2001). "Port Authority Approves New PATH Station for Lower Manhattan". The New York Times. ISSN 0362-4331. Retrieved June 11, 2018. ^ "PATH will be running two services: Hoboken to 33rd Street; and Newark to 33rd Street". panynj.gov. Port Authority of New York and New Jersey. September 11, 2001. Retrieved June 10, 2018. ^ a b "PATH Service Schedule for Thursday, 9/13/01 beginning at 6:00 a.m." panynj.gov. Port Authority of New York and New Jersey. September 12, 2001. Retrieved June 10, 2018. ^ Bye, Patricia (2013). A Pre-event Recovery Planning Guide for Transportation. NCHRP report. Transportation Research Board. p. B7. ISBN 978-0-309-28338-0. Retrieved June 11, 2018. ^ a b Glucksman, Randy (December 2013). "Commuter and Transit Notes" (PDF). New York Division Bulletin. Electric Railroaders Association. 46 (12): 9–10. Retrieved May 25, 2017. ^ "The path to a new PATH". downtownexpress.com. Community Media. June 29, 2007. Retrieved July 10, 2007. ^ Dunlap, David W. (April 1, 2008). "A New Twist at the PATH Station". New York Times. Retrieved December 13, 2016. ^ Schippert, Steve (July 7, 2006). "ThreatsWatch.Org: InBrief: Foreign Plot to Bomb Holland Tunnel Thwarted – Updated". threatswatch.org. Retrieved December 29, 2017. ^ a b Associated Press (November 1, 2012). "Christie: PATH trains out at least 7–10 days". online.wsj.com. Archived from the original on November 1, 2012. Retrieved June 13, 2018. ^ Goldman, Russell. "Hurricane Sandy: Live Updates". ABC News. American Broadcasting Company. Retrieved November 18, 2012. ^ "Limited PATH Service Resumes Between Journal Square And Manhattan". CBS New York. November 6, 2012. Retrieved April 30, 2018. ^ "Press Releases: STATEMENT OF PATH ENGINEERS AND TRANSIT EXPERT ON THE RESUMPTION OF PATH SERVICE FROM NEWARK TO 33rd STREET BEGINNING MONDAY, NOVEMBER 12, 2012". Port Authority of New York & New Jersey. November 11, 2012. Retrieved April 30, 2018. ^ "PATH train repairs to cost $300M, with Hoboken station staying closed 'for weeks'". NorthJersey.com. November 27, 2012. Retrieved October 2, 2013. ^ "Port Authority to Take Measures to Speed the Return of Service to Hoboken". The Port Authority of New York & New Jersey. Retrieved December 14, 2012. ^ Hack, Charles (December 19, 2012). "Hoboken commuters' verdict: reopened PATH train service was 'flawless'". The Jersey Journal. Retrieved December 20, 2012. ^ a b Newman, Andy (January 9, 2013). "PATH Trains to Resume 24-Hour Service". City Room. Retrieved April 30, 2018. ^ "PATH Trains to Resume 24-Hour Service Tonight". The Port Authority of New York & New Jersey. Jan 9, 2013. Retrieved February 11, 2013. ^ "Governors Christie and Cuomo Announce Full Restoration of PATH Service Between Hoboken and World Trade Center". The Port Authority of New York & New Jersey. Jan 29, 2013. Retrieved February 11, 2013. ^ Ferrer, Ana M. (January 10, 2013). "24-hour PATH service to 33rd St. restored for Jersey City, Hoboken, Newark riders". NJ.com. Retrieved June 13, 2018. ^ a b c Walker, Ameena (2018-12-05). "World Trade Center's PATH station will close for 45 weekends for repairs". Curbed NY. Retrieved 2019-01-03. ^ "Imperfect already?". City Blog. The New York Times. February 25, 2014. Retrieved December 29, 2017. ^ Rivoli, Dan (May 7, 2015). "'Awesome' new PATH station at World Trade Center opens Thursday". AM New York. Retrieved May 7, 2015. ^ a b "Timeline of the Rebuilding Effort". World Trade Center. September 8, 2016. Retrieved December 19, 2016. ^ Higgs, Larry (May 26, 2016). "New platforms, bathrooms open at $4B WTC transit hub". NJ.com. Retrieved December 19, 2016. ^ "GOVERNOR CHRISTIE AND THE PORT AUTHORITY MARK ONGOING WORK ON NEW $256 MILLION HARRISON PATH RAIL STATION". www.panynj.gov. Port Authority of NY & NJ. August 16, 2013. Retrieved January 13, 2017. ^ Duger, Rose (March 12, 2009). "Harrison unveils $75M PATH renovation plan". The Jersey Journal. Retrieved December 18, 2011. ^ "New Harrison PATH station opens". News 12 New Jersey. October 30, 2018. Retrieved October 31, 2018. ^ a b Higgs, Larry (October 31, 2018). "The newest PATH station cost $256M to build. Here's what it offers". NJ.com. Retrieved October 1, 2018. ^ a b "Siemens venture signs $321M PATH rail deal". Metro Magazine. January 19, 2010. Retrieved July 24, 2011. ^ a b Higgs, Larry (June 15, 2018). "Good news, PATH riders. Your month of misery, long delays may end Monday. Here's why". NJ.com. Retrieved June 15, 2018. ^ a b c d "Final new PATH train car put into service in Hoboken, more improvements to come". NJ.com. October 31, 2011. Retrieved March 2, 2018. ^ a b Higgs, Larry (December 6, 2017). "$300M shopping spree rolling down the PATH tracks". NJ.com. Retrieved March 2, 2018. ^ a b Associated Press (July 10, 2009). "PATH adds shiny updated rail cars to its N.J.-to-N.Y.C. lines". NJ.com. Retrieved June 14, 2018. ^ "PATH on track to finish positive train control installation by 2018 deadline". News 12 New Jersey. January 12, 2017. Retrieved March 2, 2018. ^ a b "Schedules". Port Authority of New York and New Jersey. Retrieved July 31, 2018. ^ a b "Stay on Track – PATH Weekend Closures – 2018" (PDF). Port Authority of New York and New Jersey. Retrieved July 31, 2018. ^ Berger, Paul (November 30, 2018). "PATH Train Completes Crucial Safety Upgrade Before Deadline". Wall Street Journal. Retrieved November 1, 2018. ^ Villanova, Patrick (November 6, 2018). "PATH introducing cellphone service to underground stations". NJ.com. Retrieved November 12, 2018. ^ Higgs, Larry (November 10, 2018). "PATH riders to lose weekend service on another line". NJ.com. Retrieved November 12, 2018. ^ "FY 2004–06 Transportation Improvement Program" (PDF). Retrieved October 2, 2013. ^ "Port authority to undertake study on extending path rail service to newark liberty international airport" (Press release). PANYNJ. September 20, 2012. Retrieved October 1, 2012. ^ "Governor Pataki and Mayor Bloomberg Announce Closing of Multi-billion Dollar Agreement to Extend Airport Leases" (Press release). Port Authority of New York & New Jersey. November 30, 2004. Retrieved July 3, 2011. ^ "Sources: Christie to back $1B PATH extension in Newark". Crain's. September 11, 2013. Retrieved September 15, 2013. ^ "Mixed Signals on New PATH to the Airport - WSJ.com". The Wall Street Journal. October 3, 2002. Retrieved October 2, 2013. ^ "PORT AUTHORITY BOARD APPROVES HISTORIC $27.6 BILLION 10-YEAR CAPITAL PLAN THAT FOCUSES THE AGENCY ON ITS CORE TRANSPORTATION MISSION". Port Authority of New York and New Jersey. February 19, 2014. ^ Boburg, Shawn (February 4, 2014). "Port Authority plans to extend PATH to Newark airport". The Record. Retrieved February 4, 2014. ^ "PORT AUTHORITY UNVEILS COMPREHENSIVE, PROPOSED $27.6 BILLION CAPITAL PLAN TO REVITALIZE REGION'S TRANSPORTATION ASSETS" (Press release). PANYNJ. February 4, 2014. Retrieved February 4, 2014. ^ Press Release Article – Port Authority of NY & NJ. Panynj.gov. Retrieved on June 23, 2014. ^ "Construction on PATH airport extension to start in 2018". NJ.com. October 2014. Retrieved October 22, 2014. ^ Magyar, Mark J. (October 24, 2014). "Christie's Airport PATH Deal Undercuts Rail Tunnel, PA Bus Terminal Needs". NJ Spotlight. Retrieved October 24, 2014. ^ Milo, Paul (December 17, 2014). "Port Authority hires firm to study PATH line extension to Newark Airport". The Star-Ledger. Retrieved December 17, 2014. ^ "What's the Plan for PATH Service to Newark Liberty Airport? – NJ Spotlight". www.njspotlight.com. Retrieved October 4, 2017. ^ Strunsky, Steve (November 28, 2017). "PATH extension to Newark airport set for public meetings this week". NJ.com. Retrieved November 29, 2017. ^ a b "PATH Extension Project PUBLIC SCOPING MEETINGS National Environmental Policy Act" (PDF). Port Authority of New York and New Jersey. November 28, 2017. Retrieved April 28, 2018. ^ a b c d e f g h i j k l m n o p q r s t u "PATH Timetable, Map and Guide" (PDF). Port Authority of New York and New Jersey. September 2017. Retrieved April 30, 2018. ^ "The Port Authority of New York and New Jersey – PATH". March 29, 2006. Archived from the original on March 29, 2006. Retrieved April 6, 2017. ^ "PATH Rapid-Transit System". The Port Authority of New York and New Jersey. Archived from the original on September 28, 2007. Retrieved October 27, 2008. The Port Authority Trans-Hudson Corporation (PATH) was established in 1962 as a subsidiary of The Port Authority of New York and New Jersey. The heavy rail transit system serves as the primary transit link between Manhattan and neighboring New Jersey urban communities and suburban railroads. PATH presently carries 280,000 passengers each weekday. This volume is expected to continue to increase with the anticipated growth in regional residential, commercial and business development. ^ "The PATH Train Loses $400 Million a Year. Why Keep Spending Billions on It?". The New York Times. January 2, 2019. Retrieved January 2, 2019. ^ "PATH Hoboken/World Trade Center Weekend Service Change Effective Sunday, April 9, 2006" (PDF). Port Authority of New York and New Jersey. April 9, 2006. Archived from the original (PDF) on April 10, 2006. Retrieved April 30, 2018. ^ a b Glucksman, Randy (January 2004). "INCREASED PATH SERVICE" (PDF). New York Division Bulletin. Electric Railroaders Association. 47 (1): 1–2. Retrieved May 25, 2017. ^ Villanova, Patrick (May 4, 2018). "What you need to know about PATH's new weekend closures". NJ.com. Retrieved August 1, 2018. ^ a b Craig, Philip G. (December 2011). "AN ODE TO PATH'S PA-1S" (PDF). Electric Railroaders' Association Bulletin. 54 (12): 16–18. Retrieved April 10, 2018 – via Issuu. ^ Baer, Christopher T. (April 2015). "A General Chronology of the Pennsylvania Railroad Company Its Predecessors and Successors and Its Historical Context: 1932" (PDF). Pennsylvania Railroad Technical Historical Society. p. 29. Retrieved December 7, 2015. ^ "The PATH Turns 100". The New York Times. February 26, 2008. Retrieved October 30, 2016. ^ Burks, Edward C. (July 7, 1971). "New PATH Station Opens Downtown". New York Times. p. 74. Retrieved May 30, 2010. ^ Dunlap, David W. (November 24, 2003). "Again, Trains Put the World In Trade Center". The New York Times. Retrieved January 25, 2018. ^ Strunsky, Steve (April 21, 2015). "Good and bad news for Harrison PATH riders awaiting new station". NJ Advance Media. Retrieved April 22, 2015. ^ "Harrison hopes upgraded PATH station will help welcome commuters with a grand new view". The Star Ledger. Newark. April 5, 2012. Retrieved April 5, 2012. ^ "PATH Fare Increase Goes Into Effect". NBC New York. October 1, 2014. Retrieved October 22, 2014. ^ a b c d "Fares – PATH – The Port Authority of NY & NJ". www.panynj.gov. The Port Authority of New York and New Jersey. Retrieved December 29, 2017. ^ "Fares". panynj.gov. The Port Authority of New York and New Jersey. Archived from the original on August 22, 2008. Retrieved October 27, 2008. ^ Strunsky, Steve (June 11, 2015). "Should the NYC subway map include N.J.? This man thinks so, and he's not alone". nj.com. New Jersey On-Line. Retrieved April 6, 2017. ^ "HUDSON TUBES ASK 5-CENT FARE RISE; Increase Would Apply to All Except Newark Rate, Which Must Be Set With Pennsy HUDSON TUBES ASK 5-CENT FARE RISE". The New York Times. September 18, 1961. Retrieved June 12, 2018. ^ "Port Agency Plans To Cut Tube Fare To Newark by 10c". The New York Times. November 13, 1966. Retrieved June 12, 2018. ^ "15c PATH Fares On Intrastate Runs Will End on Oct. 19". The New York Times. September 14, 1970. Retrieved June 12, 2018. ^ Peal, Frank J. (November 7, 1971). "PATH Discontinuing Tokens for Cash". The New York Times. Retrieved June 12, 2018. ^ "Annual Report 1990" (PDF). Port Authority of New York and New Jersey. December 31, 1990. p. 33. Retrieved June 10, 2018. ^ a b McGeehan, Patrick (February 21, 2006). "New at PATH Stations: Wave, Don't Swipe". The New York Times. Retrieved June 10, 2018. ^ a b Kennedy, Randy (November 4, 1996). "PATH System Might Link To Metrocard". The New York Times. ISSN 0362-4331. Retrieved June 10, 2018. ^ Buccino, Anthony R. (October 26, 2008). "Bye-bye PATH QuickCards". NJ.com. Retrieved June 10, 2018. ^ a b "PATH Phasing Out QuickCard Payment". Asbury Park Press. October 25, 2008. p. 10. Retrieved June 10, 2018 – via Newspapers.com. ^ Higgs, Larry (January 6, 2016). "PATH riders who use this card have until Feb. 12 to trade it in". NJ.com. Retrieved June 27, 2018. ^ Marsico, Ron (July 4, 2007). "Lower Manhattan now offers PATH to a smarter commute". The Star-Ledger. Retrieved July 10, 2007. ^ "How does Automatic Replenishment work?". Port Authority of New York and New Jersey. Retrieved June 13, 2018. ^ "MetroCard". panynj.gov. Retrieved June 10, 2018. ^ Harmon, Amy (August 11, 1997). "What Galls a Hacker Most? The Metrocard". The New York Times. ISSN 0362-4331. Retrieved June 10, 2018. ^ "PATH Frequently Asked Questions – The Port Authority of NY & NJ". www.panynj.gov. Retrieved June 10, 2018. ^ "PATH Is Installing High-Tech Fare System". American Public Transportation Association. June 6, 2005. Retrieved June 10, 2018. ^ "New York PATH Railway Upgrade". Railway-technology.com. Retrieved June 12, 2018. ^ "Port Authority Board Authorizes Purchase of 50 New Rail Cars for PATH System". Mass Transit. December 8, 2017. Retrieved December 9, 2017. ^ a b "Kawasaki awarded $240m supply and refurb contract for New York subway fleet". Global Rail News. July 30, 2018. Retrieved August 1, 2018. ^ "PATH, Kawasaki sign for new, refurbished cars". Railway Age. August 1, 2018. Retrieved August 1, 2018. ^ a b Braun, Martin (August 22, 2014). "PATH Train Less Efficient Than Subways as Cars Cover Loss". Bloomberg.com. Retrieved January 4, 2018. ^ "Port Authority Trans-Hudson Corporation Minutes" (PDF). August 5, 2010. Retrieved October 2, 2013. ^ PowerPoint Presentation. (PDF) . Retrieved on June 23, 2014. ^ a b c d e f "PATH/H&M Complete Roster". Long Island Rail Road Photos, Maps, and History. January 8, 2003. Retrieved June 12, 2018. ^ a b c In Re Hudson & Manhattan Railroad Company , 138 F. Supp. 195 (S.D.N.Y. 1955). ^ a b Chiasson, George (August 2015). "Rails Under the Hudson Revisited – The Hudson and Manhattan". Electric Railroaders' Association Bulletin. 58 (8): 7. Retrieved April 10, 2018 – via Issuu. ^ "TUBE SERVICE TO NEWARK. ; Pennsylvania-Hudson Steel Trains in Operation This Morning". The New York Times. November 26, 1911. ISSN 0362-4331. Retrieved April 11, 2018. ^ In Re Hudson & Manhattan Railroad Company , 172 F. Supp. 329 (S.D.N.Y. 1959). ^ a b Williams, Lena (November 27, 1984). "JAPANESE TO MANUFACTURE TRANSIT CARS IN YONKERS". The New York Times. Retrieved June 12, 2018. ^ "Japanese firm coming to Otis" (PDF). Yonkers Herald Statesman. December 2, 1984. pp. B3. Retrieved June 15, 2018 – via Fultonhistory.com. ^ "Collision of Port Authority Trans-Hudson Train with Bumping Post at Hoboken Station, Hoboken, New Jersey, May 8, 2011" (PDF). National Transportation Safety Board. 2012. p. 3. Retrieved June 12, 2018. ^ a b Chiasson, George (December 2015). "Rails Under the Hudson Revisited – The Hudson and Manhattan". Electric Railroaders' Association Bulletin. 58 (12): 2–3. Retrieved April 10, 2018 – via Issuu. ^ "9/11 survivor to Shore Line Museum". Retrieved April 6, 2017. ^ "9/11 surviving PATH Subway Car will arrive at SLTM – Thursday, August 6th 11:15 AM – The Shore Line Trolley Museum Operated by the Branford Electric Railway Association, 17 River Street, East Haven, CT, 06512". Retrieved April 6, 2017. ^ "PATH train cars that survived 9/11 on display in CT, NY trolley museums". December 4, 2015. Retrieved April 6, 2017. ^ "Federal Railroad Administration: Passenger Rail; Chapter 1". Archived from the original on March 20, 2009. Retrieved March 3, 2009. ^ "Siemens lands PATH CBTC contract – Railway Age". Railway Age. October 27, 2009. Retrieved June 11, 2018. ^ "Amtrak's Northeast Corridor: Information on the Status and Cost of Needed Improvements". U.S. Government Publishing Office. April 13, 1995. Retrieved June 11, 2018. ^ a b "PATH Rules & Regulations" (PDF). Port Authority of New York and New Jersey. December 20, 2015. Retrieved April 6, 2017. ^ a b "Is it really illegal to take pictures in the train station? Transit agencies have differing policies for photographers videographers". Hudson Reporter. December 23, 2014. Retrieved March 2, 2018. ^ Krages, Bert (November 1, 2006). "Legal Handbook for Photographers: The Rights and Liabilities of Making Images". Amherst Media, Inc. Retrieved April 6, 2017 – via Amazon. ^ Jacobs, Karrie (July 2006). "The Ad at the End of the Tunnel". Metropolis. ISSN 0279-4977. Archived from the original on July 15, 2006. ^ "Holiday tree decorates PATH tunnel", Jersey Journal, December 20, 2001. ^ Kaufman, Gil (October 13, 2003). "The Story Behind The White Stripes' 'Hardest Button': Lens Recap". MTV.com. Retrieved October 2, 2013. ^ "'Law & Order: SVU' Premiere Filmed At Oculus" (PDF). PA News. Port Authority of New York and New Jersey. 16 (16): 1. August 8, 2017. Retrieved June 12, 2018. ^ Bindelglass, Evan (September 20, 2017). "20 best NYC subway cameos in movies and TV". Curbed NY. Retrieved June 13, 2018. ^ "TUBE TRAINS CRASH IN FOG; 50 ARE HURT; Motorman of Rear Train Charged With Exceeding Rule as to Speed. HURT TOO BADLY TO TALK Eight Victims Seriously Injured, Some May Have Fractured Skulls.TWO INQUIRIES ARE BEGUNSteel Cars Prevent Loss of Life inAccident in New Jersey Meadows. First Train Halted. Motorman Unable to Talk. President Root's Statement". The New York Times. September 1, 1922. Retrieved June 12, 2018. ^ "1 KILLED, 15 INJURED IN TUBE TRAIN CRASH; Boy, Standing at Front of Car, Crushed in Collision Near Manhattan Transfer. OTHERS SERIOUSLY HURT Motorman Tells Police That His Brakes Failed to Work Properly". The New York Times. July 12, 1923. Retrieved June 12, 2018. ^ "HUDSON TUBE CRASH AT 33D ST. HURTS 19; SMASHED CAR IN HUDSON TUBE, WHERE NINETEEN WERE INJURED". The New York Times. January 17, 1931. Retrieved June 12, 2018. ^ "21 Hurt in Accident in Hudson Terminal; Car Jumps Tracks and Crashes Into Wall". The New York Times. August 23, 1937. Retrieved June 12, 2018. ^ "22 HURT IN JERSEY IN TUBE LINE CRASH; 300 Shaken as Switch Engine Sidewipes a City-Bound Train at Kearny Two Hurt Seriously List of Injured 22 HURT IN JERSEY IN TUBE LINE CRASH". The New York Times. November 27, 1938. Retrieved June 12, 2018. ^ "5 Inquiries Opened in Jersey In Tube-Train Crash Killing 2; None of Crew Hurt". The New York Times. July 25, 1963. Retrieved June 12, 2018. ^ "CHARGE IN CRASH UPHELD; Chemical Test Indicates Jersey Motorman Was Intoxicated". The New York Times. April 29, 1942. Retrieved June 12, 2018. ^ "WRECK INQUIRY IN JERSEY TODAY; Two Groups to Hold a Joint Investigation in Crash of Hudson Tube Train Test Run Is Planned 12 Still In Hospital". The New York Times. December 19, 1945. Retrieved June 12, 2018. ^ "H. & M. CRASH HURTS 30; One Train Runs Into Another at Journal Square Station". The New York Times. December 15, 1958. Retrieved June 12, 2018. ^ "100 Injured as PATH Train Smashes Into a Second in Jersey City; 100 Are Injured in Jersey City Crash". The New York Times. January 12, 1968. Retrieved June 12, 2018. ^ a b Cowan, Alison Leigh; Secret, Mosi (May 8, 2011). "Dozens Injured as Train Crashes in New Jersey". The New York Times. Retrieved May 8, 2011. ^ "PATH train crashes into platform at Hoboken Terminal". Retrieved May 8, 2011. ^ "Hoboken Train Crash Kills 1 and Injures Over 100". The New York Times. September 30, 2016. Retrieved June 12, 2018. ^ Associated Press (June 4, 1982). "28 hurt battling PATH fire" (PDF). Nyack Journal News. pp. A4. Retrieved June 15, 2018 – via Fultonhistory.com. ^ Narvaez, Alfonso A. (August 9, 1983). "CEILING CRASHES AT PATH CENTER, KILLING 2 AND INJURING 8 IN JERSEY". The New York Times. Retrieved June 12, 2018. ^ Associated Press (August 9, 1983). "Probe begins in PATH disaster" (PDF). Yonkers Herald Statesman. p. 6. Retrieved June 15, 2018 – via Fultonhistory.com. Carleton, Paul (1990). The Hudson & Manhattan Railroad Revisited. D. Carleton Railbooks. Wikimedia Commons has media related to Port Authority Trans-Hudson. Illustration of Incidents in Tunnel Construction – H.&M. R.R. Co.